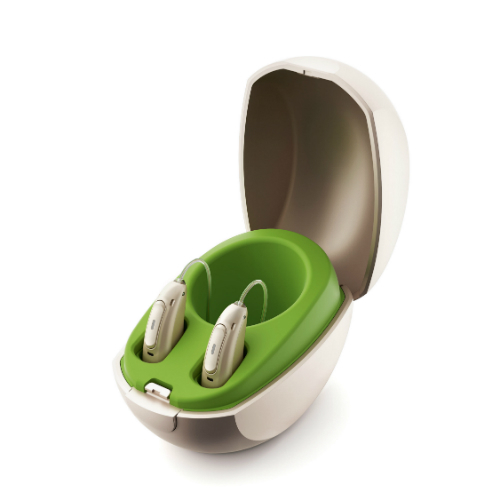 Phonak have recently announced the release of their latest hearing devices. The Phonak Audéo Marvel is the first hearing aid to feature direct Bluetooth® connectivity to both Android™ and iPhone® devices to both ears and in stereo quality. The new hearing aids are the first to feature Phonak’s new AutoSense 3.0 software platform. Phonak advise the new AutoSense 3.0 provides exceptional sound quality, better speech understanding in noise, reduced listening effort and a rich sound experience when streaming. A new rechargeable model will provide 24 hours of daily use on a single charge and a smaller charging case that turns the hearing aids on automatically as soon as they are removed from the charger. Directly connect to Bluetooth® devices in stereo including streaming from your Bluetooth TV. For those without a Bluetooth TV you can also use the Phonak TV connectivity box for a highly rated streaming solution. Hands free calling means you can answer your phone with a touch of a button on your Phonak Audéo Marvel devices whilst built-in microphones enable you to speak to the person without having your phone in your hands and with voice in both ears. Fine-tune streamed sounds via the Remote App so you can hear your favourite music and programs at desired levels. The myPhonak app allows your hearing care professional to provide real time remote video support and remote programming changes so you don’t need to schedule face-to-face appointments. The new myCall-to-Text app will transcribe your phone conversation to the screen of your mobile phone in real time in more than 80 languages. From Autumn 2019 the devices will directly connect to Phonak’s vast selection of Roger accessories such as the Roger Pen that help you hear in the most challenging situations. There is great excitement from both consumers and hearing care professionals for the launch of the Phonak Audéo Marvel and Keeley is attending the UK launch in London on Friday 2nd November where she will find out more. We have many customers across Bournemouth, Poole, Christchurch and Purbeck who love their Phonak hearing instruments and we look forward to seeing how the new AutoSense 3.0 platform in the Audéo Marvel helps with improvement in hearing. The Phonak Audéo Marvel will be available to order from the 5th November with orders being shipped from Wednesday 21st November. If you would like to register your interest, please let us know.